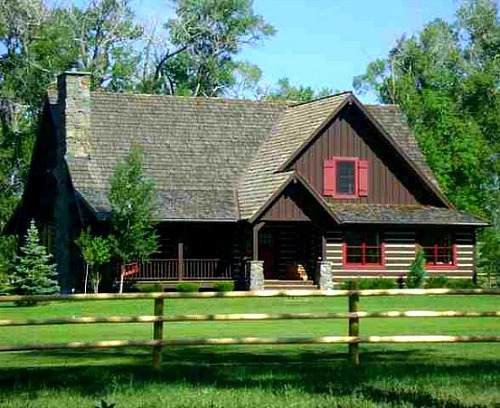 A reader named Alicia wrote me about the house in Montana she built on 180 acres near the small town of Ennis. That means selling this one first, though. Take a look! The house has 3 bedrooms, 3 baths, and 3,100 square feet. 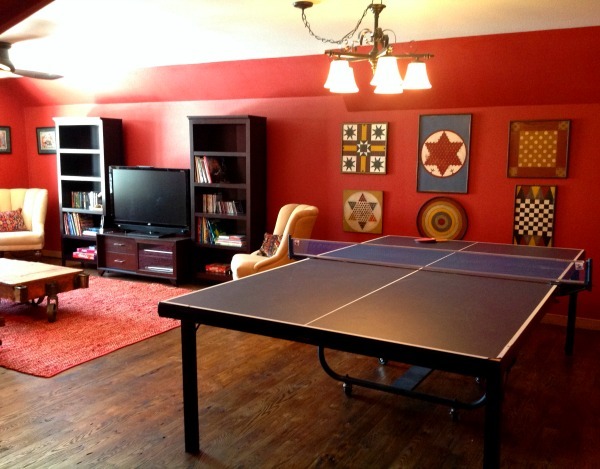 “The game room (a.k.a. the man cave) is a fun place for all of us to hang out with friends. “Thanks to our special location, we see abundant wildlife including moose, dear, elk, bear, bobcats, antelope, river otters….the list goes on and on. I love it when readers share their house stories with us. 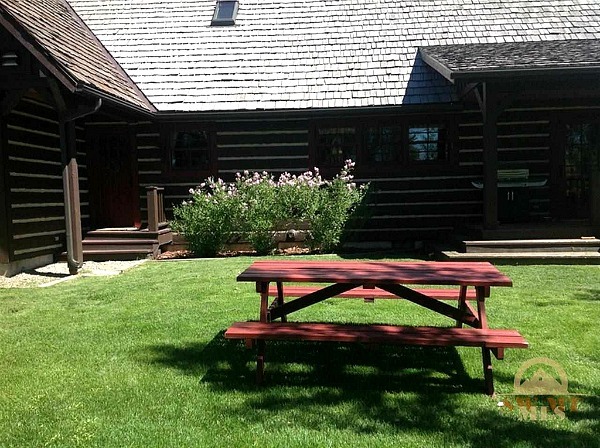 Thanks to Alicia for sharing her house in Montana with us! Want it? 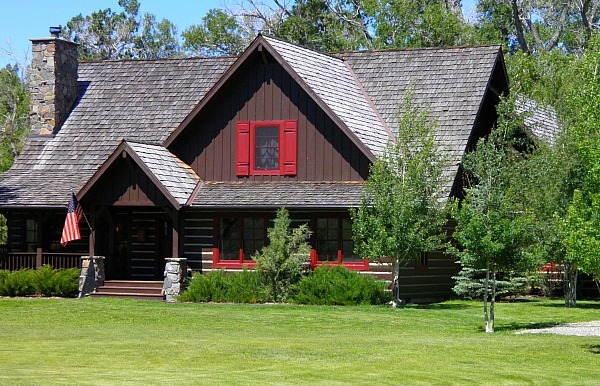 Visit Prudential Montana Real Estate for all the photos and details about the property. Wonderful mix of antiques. The kitchen sink is so perfect for the charm factor alone. 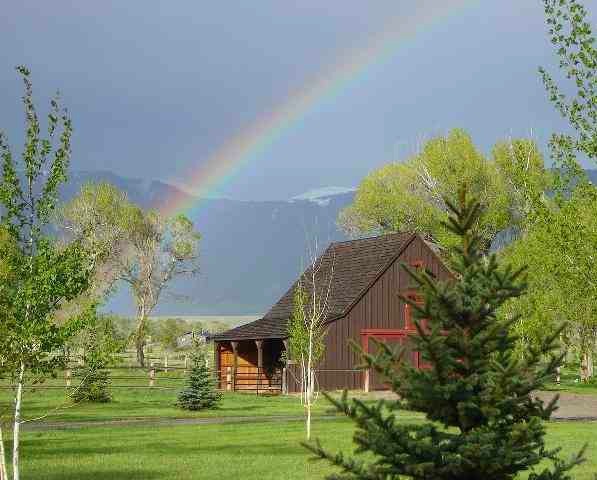 The crowning points that put it over the top for me are the spectacular pond (would totally love to watch the animals come to it) & the rainbow shining from above. Truly magical. “Magical” is a good work to describe it! This a stunning home. I love it! 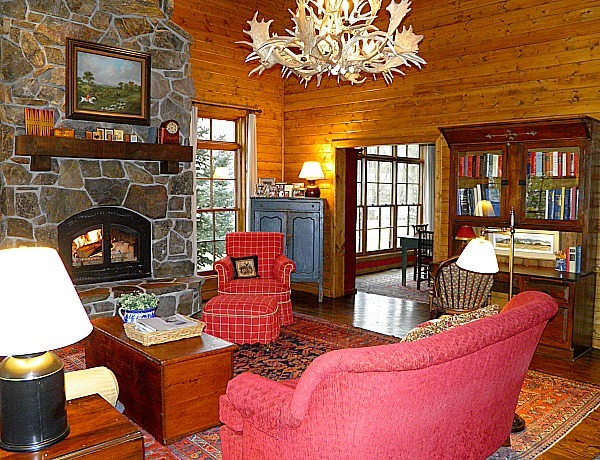 I am not usually a fan of so much wood paneling, but it is so perfect here. The kitchen is great, I have my cabinets painted the same color! 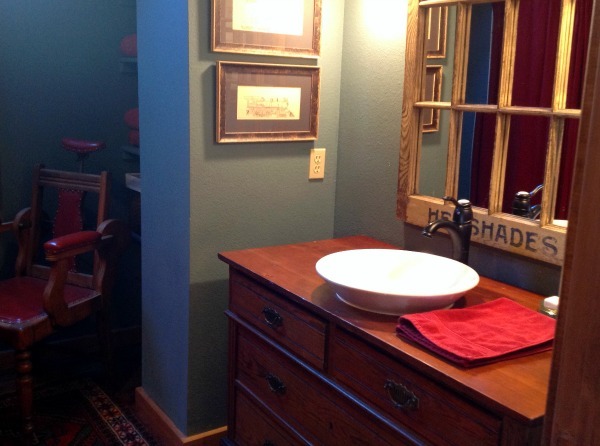 I really like her idea of making the bathroom looks less “bathroomy”. 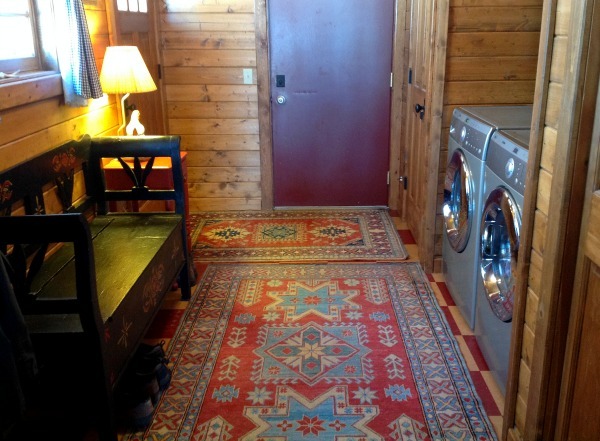 Love her use of patterns in rugs, quilts and game boards. The more I look the more I love, and the location is to die for!!!!! 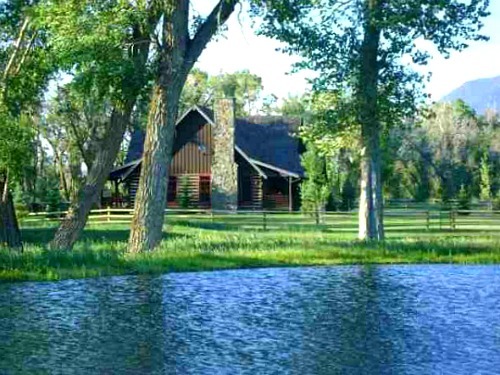 I can’t imagine selling this home…and if I had $1,999,999.00 I’d buy it in a heartbeat. Absolutely awe-inspiring. I love every square inch of this place! I can’t believe anyone would want to give it up! 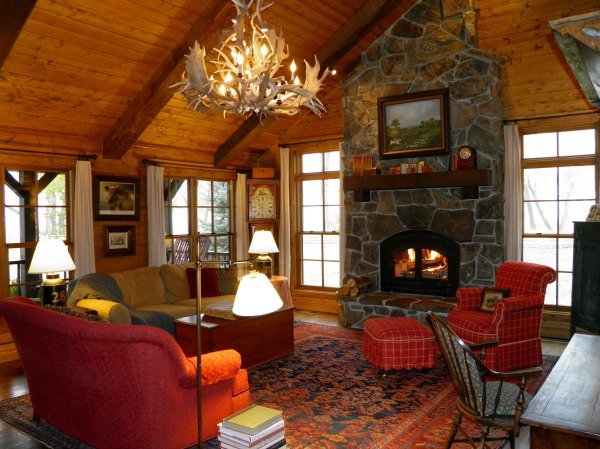 Stunning home, really well decorated, and the setting is from a picture book. 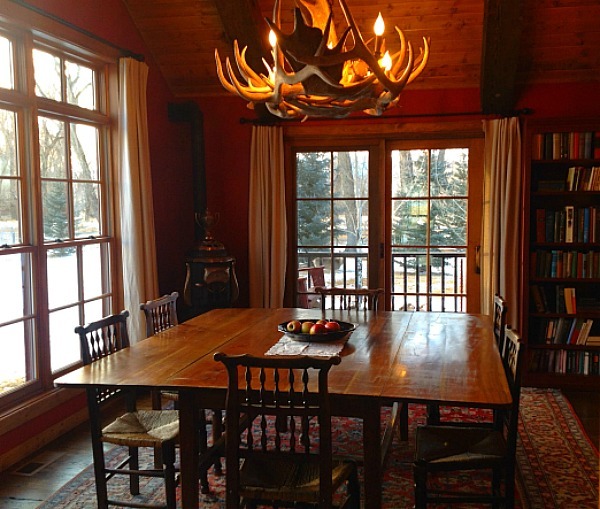 I could imagine spending many hours around that huge dining room table with the family! Best of luck to her. I love that big dining table! Well that is just fantastic! 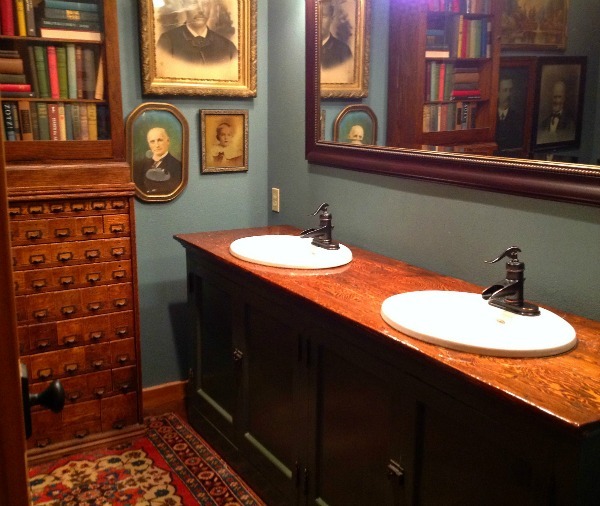 I love this house, especially that first interior shot. She did such a great job of decorating, and the views are amazing. I still prefer ocean over mountains, but if money was no object and I could have both, I’d go for it! 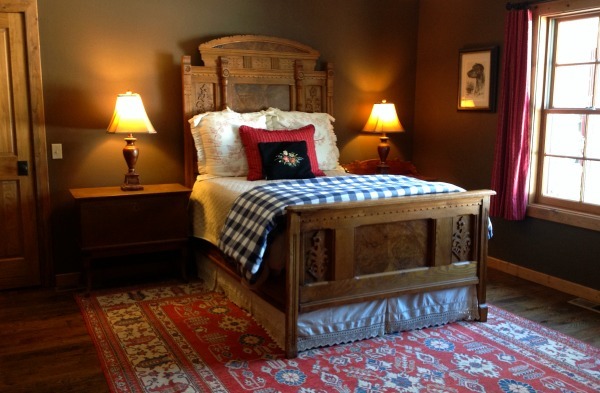 Okay, so you had me at Rustic English-Country Style. 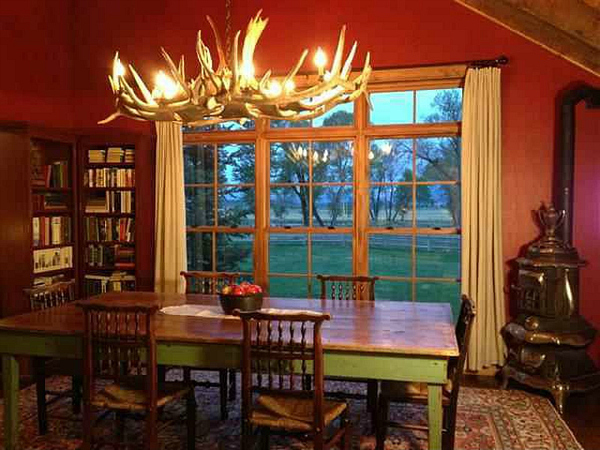 The exterior was totally my taste, with the dark wood, the chinking + red accents. Man, do I love red! Meanwhile, that library bathroom really makes a gal want to ramp up HER game, doesn’t it? 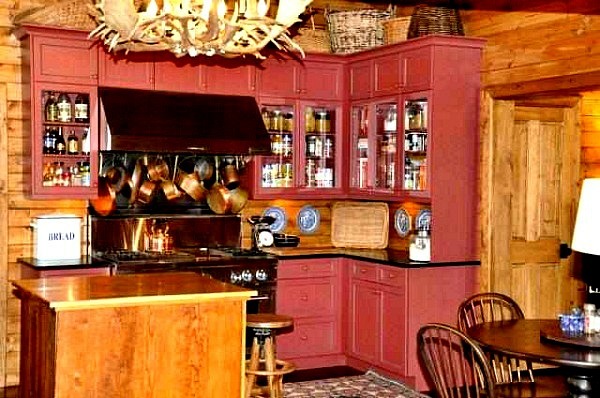 I’m loving the red with the wood, too. So cozy! Wow – just wonderful! 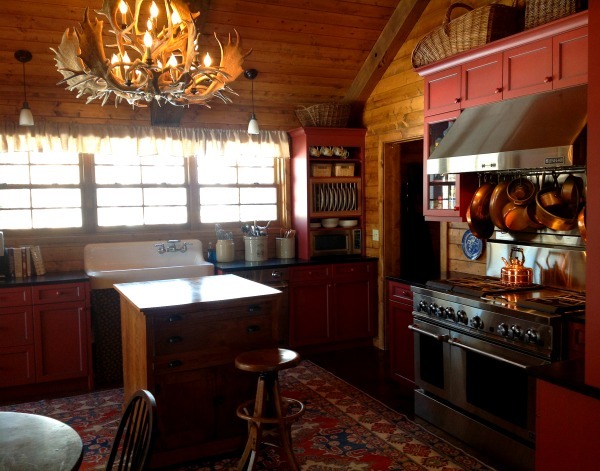 Love her western rustic + English country aesthetic. Love her mix of antiques and her library rooms – cabinets and shelves full of books lend such comfort and enticement to a room. I’m sure though, like you, Julia, that I’d spend most my time staring out the windows! Wow, Ci….you are good! I hadn’t noticed the table switch-up. 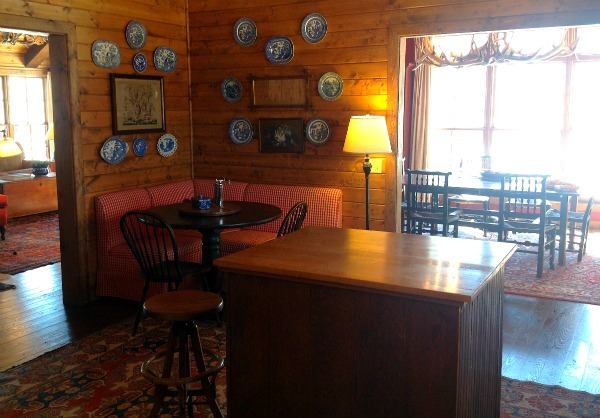 I think I prefer (at least in this setting) the more casual, harvest table, as opposed to the drop-leaf. I noticed that, too! Like them both, but I love that large drop-leaf table! 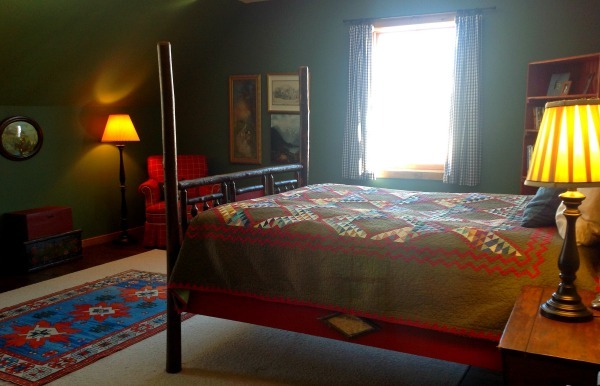 The listing photo also shows a sleigh bed in the green bedroom instead of the Old Hickory style log bed. Wonder if it’s made its way to the cabin, too? What a beautiful home. It’s location is a little bit of paradise! This is breathtaking, what a treasure they have in their hands. Why sell it? I would buy it if I could! Hi Julia! Another special post!!! That is just an amazing setting!!!! Alicia did a wonderful job, I always love a mix of rustic and feminine! Well done! I can’t wait to see her next project! Thank you both for sharing! This lady’s sense of style really inspires me. This home is beautiful and timeless. It’s obviously decorated in her own personal style, rather than any trend from a magazine anywhere. I love it when people can create something that is truly unique, and beautiful. I drool for that red couch, and so many other elements. 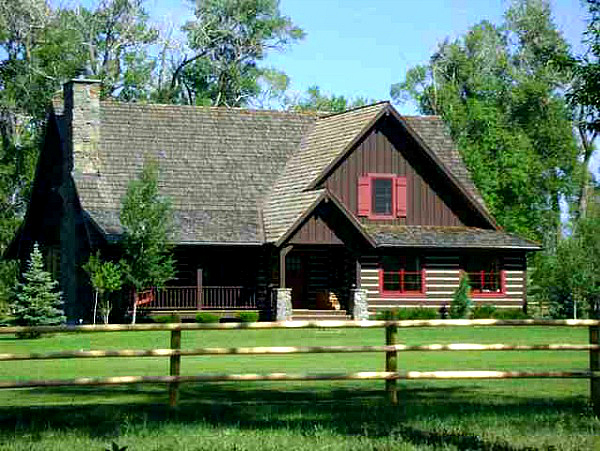 Our home is also a mix of English (or rather made up European) and log cabin style in a lovely natural setting. Now what are you supposed to do with that? She’s show that the only answer is to make it up yourself. Hats off! I agree, Wendy, I love the originality of this place! 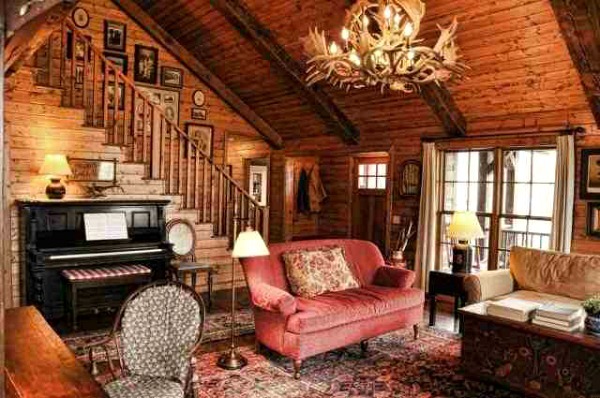 It reminds me a bit of a bed and breakfast I stayed at once; the main difference being that the log cabin B and B was furnished completely in the English Lodge style, whereas this is a wonderfully eclectic mix of rustic and traditional. Alicia should be a designer! Oh my goodness! This is gorgeous. I wish it was near me and not so far away, I would buy it. you have a fan in Missoula Montana too!! 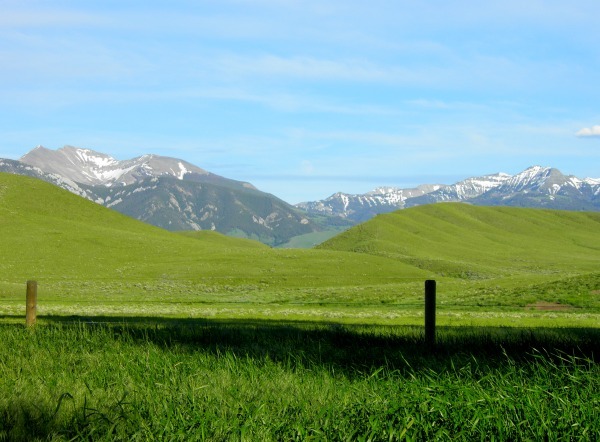 I’d love to visit Montana someday. It looks so beautiful! !